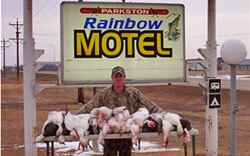 SD Hunting Info, a statewide directory of hunting and hunting resources for South Dakota. Hunting is a year-round sport in South Dakota, where hunters have access to nearly 4.5 million acres of public land. Upland game, waterfowl, pheasant, small game and big game dominate the state's fall hunting seasons. Predator hunting fills winter months, spring brings turkey hunting, and prairie dog hunting consumes the summer. Some of America's most storied National Forests and Parklands are found in Western South Dakota. Full continental breakfast, wireless internet, cable tv, laundry services, fridge or microwave upon request, smoking or non smoking rooms, pet rooms and pheasant cleaning station for the hunters. Campground with full hook up 110, 10, 30 or 50 amps, cable, picnic tables at each campsite, water and sewer. Welcome to scenic South Dakota and the SD Hunting Info web site, your complete guide to motels, lodging and other places to stay while hunting in South Dakota! Your travel and hunting plans come alive when you enter this majestic state with its beautiful National Forests and grasslands offering some of North America's finest pheasant and game hunting. These attractions include the awe-inspiring Mount Rushmore and the magnificent carving of Crazy Horse. Any time is a good time to take a trip through Custer State Park, in the heart of the Black Hills (where the buffalo roam) or the unique beauty of the Badlands. Also, experience the nonstop gaming fun of Deadwood gambling or Sturgis Rally, where motorcycles rule during August, time of the world famous Sturgis motorcycle rally. Whatever your hunting vacation pleasure, South Dakota Hunting Info web site will provide you with information on where to go and what to do to make your hunting vacation a wonderful event. Happy hunting in South Dakota!